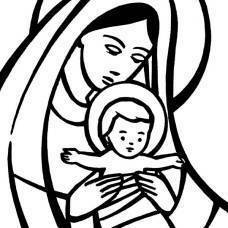 The Mother to Mother ministry began in September 1995 at St. John the Baptist Catholic Church in Newburgh. Since that time, the group has reached beyond the walls of the church to welcome new families and to let women know that mothering matters. We, Mother to Mother Ministry of the church of St. John the Baptist, Newburgh, declare it our primary purpose to provide an intimate, safe atmosphere where women come and find encouragement, instruction, prayer time, and caring friends. A place where mothers help welcome mothers home with new babies. Our doors are open to all mothers, including those of other parishes and faiths. We welcome "seasoned" mothers to share their wisdom and experience as well as first-time expecting mothers to share their joys and anticipations. New members are welcome at any time during the year. Whether you have lived in Newburgh your entire life or just moved here from far away, you will find our group to be a supportive community during your journey through motherhood. We meet on the first and third Thursdays of every month during the school year (third Thursday in August through third Thursday in May). Our meetings are held in the Ruth and Naomi room in the lower level of the church. We begin at 9 a.m. and end by 11 a.m. On-site babysitting is provided in three separate rooms for infants, toddlers, and preschoolers. Nursing babies and little ones are welcome to attend the meetings with you if you prefer. Our meeting topics include informative sessions focusing on parenting, marriage, spirituality, and health issues. We also have time to come together for prayer and fellowship. Unless otherwise noted, all meetings are held in the Lower Level of the Church on the first and third Thursdays from 9:00 AM to 11:00 AM. Lord, we give you thanks for having given us children. They are our joy, and we accept with serenity the worries, fears, and labors which bring us pain. Help us to love them sincerely. Through us You gave life to them; from eternity You knew them and loved them. Give us wisdom to guide them, patience to teach them, vigilance to accustom them to the good through our example. Please, Lord, support our love for our children. Support us in our journey of mothering. We look to Your own mother Mary, as our guide for support and comfort. And so, with Mary, we ask for strength and guidance to be the best mothers that we can be. For more information, please call the parish office at (812) 490-1000 or email Jay VanHoosier at jwvanhoosier@evdio.org.